Tank style dress with open back crossing straps adorned with a bow. Made from a mixture of TS3 and TS4 textures. Comes in 32 colors. 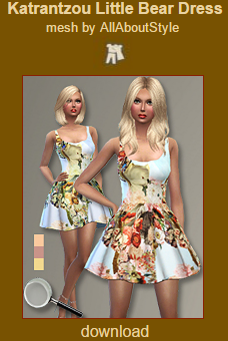 Katrantzou Little Bear Dress mesh by All About Style is NOT included and is required for this download. Get it here.